Fall is for contemplation. Fall is for respecting the life cycle of nature. Fall is for taking some time for ourselves and having a think, as our British neighbors across the pond like to say. Fall is also for turning up that heat dial and making sure your toes don’t get too chilly as the temperature drops. If you have home propane services, perhaps from an Upstate New York propane supplier like DiSanto Propane, then you probably are already familiar with the savings you experience when using propane for appliances and beyond. Yearly savings typically extend over $100, not to mention the fact that you can dramatically reduce your carbon footprint by using this environmentally-friendly fuel source. What’s more, people love switching to DiSanto Propane in particular because we offer fixed monthly rates, meaning that you won’t get stuck with a massive energy bill as soon as it gets cold each year. Being able to consistently budget for your energy bill is yet one more way we try to separate ourselves from other propane suppliers in the area — and it’s another reason we’ve been a family-owned propane company that’s been around over 80 years! Today’s post isn’t entirely about our propane services for home and business, however. As the title no doubt gave away, it’s about offering our readers the chance to reflect on what makes fall so special. Summer is well and gone, for better or for worse, and we at DiSanto are of the opinion that we should welcome the fall with open arms! So if you could use a little inspiration for such a welcoming, please read on; we are happy to provide you with a few quotes and poems about our favorite season. Let’s start off with a lovely little quote from an unknown author. It’s just as well that the writer remains anonymous, as whoever penned this captured our collective sentiments on the matter. Rilke is known as being one of the most intense German-language poets of all time, and despite the fact that this quote is (obviously) in English, the intensity clearly was not lost in translation. There is something about fall that reminds us of the circle of life and that old things must pass for new things to grow. That’s lovely. We may or may not have included this quote in here because it is about New York in the fall. But there is good reason for talking about the beauty of New York during this time of year. In fact, we’d argue that there is no better place in the world than this part of the country. Albert Camus, the French philosopher, proves he is a poet as well with this simple and glorious line. We are into it. Yes, Octobers are wonderful. Change is wonderful. It keeps us grounded and reminds us of a future and a past all at once. Stephen King is amazing, in case you didn’t know, as this excerpt clearly exemplifies. It’s true that summer seems to be here one day and gone the next. Before you know it, the leaves have all been blown away and we are faced with the bitter cold for a few months. So let’s enjoy the changing colors and falling leaves like an old friend’s company while we can! She may have contributed to the breaking up of the greatest musical group of all time, but by golly she’s got a memorable quote or two in her. This quote is sublime, in our humble opinion. Thanks, Yoko. “October gave a party. The Leaves by hundreds came — The chestnuts, Oaks, and Maples, And leaves of every name. The Sunshine spread a carpet, And everything was grand, Miss Weather led the dancing, Professor Wind the band. The Chestnuts cam in yellow, The Oaks in crimson dressed; The lovely Misses Maple In scarlet looked their best; All balanced to their partners, and gaily fluttered by; The sight was like a rainbow New fallen from the sky. The final autumnal quotation we’ll leave you with is this light-hearted poem by George Cooper. After all, autumn isn’t only about death for the sake of rebirth. It can be simply about enjoying the colors for what they are. Nothing more, nothing less. Shifting gears — for sadly, we don’t make much money from talking exclusively about how much we like different seasons — we’d like to punctuate this post by briefly describing our propane services. We provide propane services for your home and commercial propane services for your business. Below we’ll discuss each for just a moment! In terms of affordable residential propane services, DiSanto is tough to beat. As most of us know, the weather in Upstate NY can be unpredictable at the best of times, as fall is no exception to that trend. Because of this, we offer fixed monthly pricing the whole-year-round. This means your bill will be reliable stable, even if the amount of energy you use and the weather isn’t! In general, propane can be used in the home for a variety of purposes, from water heating to clothes drying to power generation to kitchen appliances! It’s a safe, clean, reliable, and affordable energy source as well! Whether you are a contractor looking to keep your workspace warm, a company decision maker that relies on forklifts in its daily operations, you’re in charge of fueling a fleet of vehicles, or you are a farmer looking to optimize your systems by using agricultural propane due to its reduced emissions and cost-effectiveness — we don’t mind! The important thing is that you know where you can find commercial propane, and that’s right here at DiSanto. 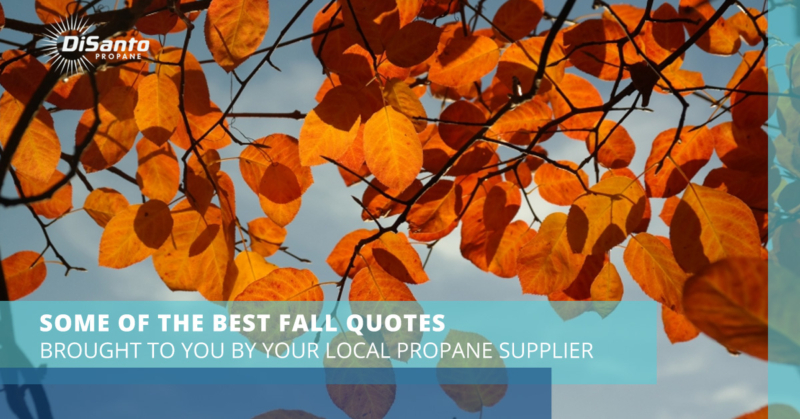 We are passionate about the fall, but that fervor pales in comparison to the passion we have for helping folks in Upstate New York get access to the world’s best fuel source, propane. It’s reliable, easy-to-use, versatile, and all the other things we’ve mentioned today. If you are looking to save money by switching to propane, reach out to us today to become a customer! We’d love to hear from you and see how we can meet your unique needs.